This entry was posted in Freedom, Gun Rights, Politics, Quote of the Day, They want you dead by Joe. Bookmark the permalink. Man’s law verses Man’s law equals War. After that war we begin the run-up to the next war. So WHAT if a billion people have to die? By what principle should that be an impediment to doing whatever it is that someone assumes “needs” to be done? You post the image of the extermination wall as though it were a bad thing. By what standard is it bad? 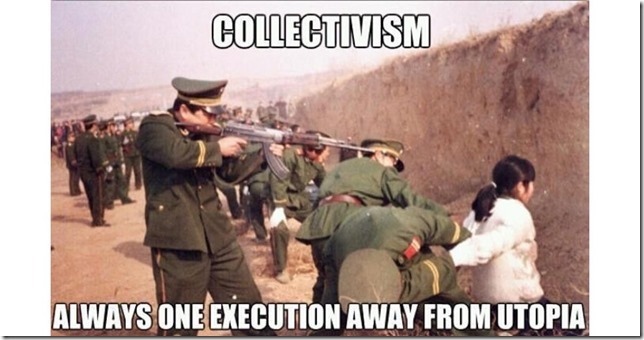 Maybe the communists simply haven’t killed enough people to make Earth a paradise. If someone thinks they have the recipe for paradise, then who are who, and by what authority should you be allowed, to oppose them? 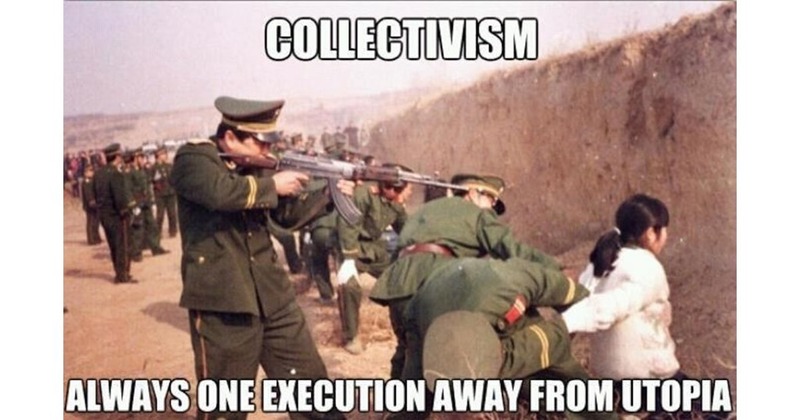 If you stand in any way whatsoever in opposition to a collectivist paradise, and you’re clearly incapable of seeing the brilliance of it or of ever changing your mind, then why shouldn’t you be eliminated at the earliest opportunity, without pause? By what standard or what authority do you oppose these things? Because you said so? Because you have a degree or an IQ of such-and -such? Plenty of other people say otherwise, and they have degrees and IQs too. Beyond claims of “Do what I say because I’m smarter than you” or “do as I say or I’ll kill you” neither “side” in this conflict has anything. Thus both “sides” are really one side. They are both empty. The thesis is founded on the same bases as the antithesis, and the synthesis (destruction and death) was predetermined long ago. On the other hand we have the Ten Commandments and the long string of prophesies that have been fulfilled and still we argue. 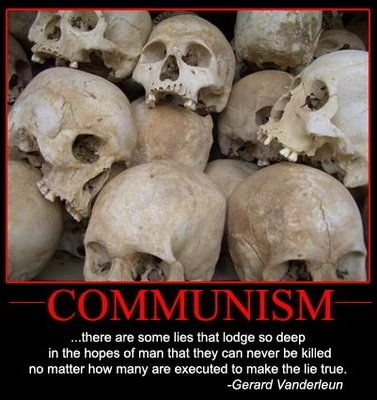 The Ten Commandments have been re-written and lied about, those who pretend to uphold them are usually liars, and so unless you dig deep and look past what’s presented to you you’ll find only what I wrote above; unsubstantiated assertion verses unsubstantiated counter assertion equals brute force. Why should things ever change? You must have some pre-determined standard before you can answer that question. Did you invent that standard? It is all yours, and if so what’s to stop everyone else from having their own standards? You? Your guns? The best deep dive which I have found so far into this line of thinking is Objectivism where “the proper moral purpose of one’s life is the pursuit of one’s own happiness (rational self-interest), that the only social system consistent with this morality is one that displays full respect for individual rights embodied in laissez-faire capitalism”. As soon as I read ‘tens of thousands of words’, a phrase popped up in my mind. And the source is delicious as well, if you remember it. KISS. I highly recommend it in engineering and in life. But sometimes it’s not easy. Try putting a person on Mars or building the Internet, from human user interface to data centers, using that principle. Marx and Engels, on the other hand, didn’t put a person on Mars or build the Internet. They build the foundation for systems which murdered hundreds of millions and created misery on such a grand scale that it may never be equaled. I suppose that can be considered an accomplishment of sorts. But try reading their works and you find it indecipherable (Das Kaptial) or a synopsis of a poorly written alternate history novel (The Communist Manifesto). Did Engels do anything except provide money for that layabout Karl Marx? He co-authored The Communist Manifesto. He added the “Fourth Volume of Capital”. And he contributed many other communist theory things as well. As a researcher, I would suggest instead, keep it as simple as possible for it to still work as intended. The good news is that this moron isn’t a representative; he got blown out hard in the 2014 primary, and hasn’t tried since then (at least as a Republican). So what is he running for now? His Twitter account seems to say that he’s a candidate now — not years ago. He made zero impact in the 2014 primary (reference data here: https://ballotpedia.org/Robert_Shattuck ). Gary Palmer ran unopposed in the 2018 primary and will face Danner Kline for the seat in November. It looks like he’s grandstanding and trying to make himself look good for #nevertrumper or leftist dollars. I could be wrong though.